The ProFast Premium Deck Screw patented design requires no pre-drilling and is great for decking and all exterior wood projects. Specially formulated to prevent rust, staining or streaking in chemically treated wood including ACQ. The Paulin brand deck screw is an exterior rated screw designed for wood to wood fastening. The specifically formulated coating is design to prevent rust, staining or streaking in all pressure treated wood. The DURA-GRIP square drive head improves drive torque performance and helps to avoid slipping. The Saw Tooth threads provides a faster driving screw while reducing wood splitting. An average of 4 to 6 screws are required per square foot when using a 2 x 6 or 5/4 x 6 wooden decking. 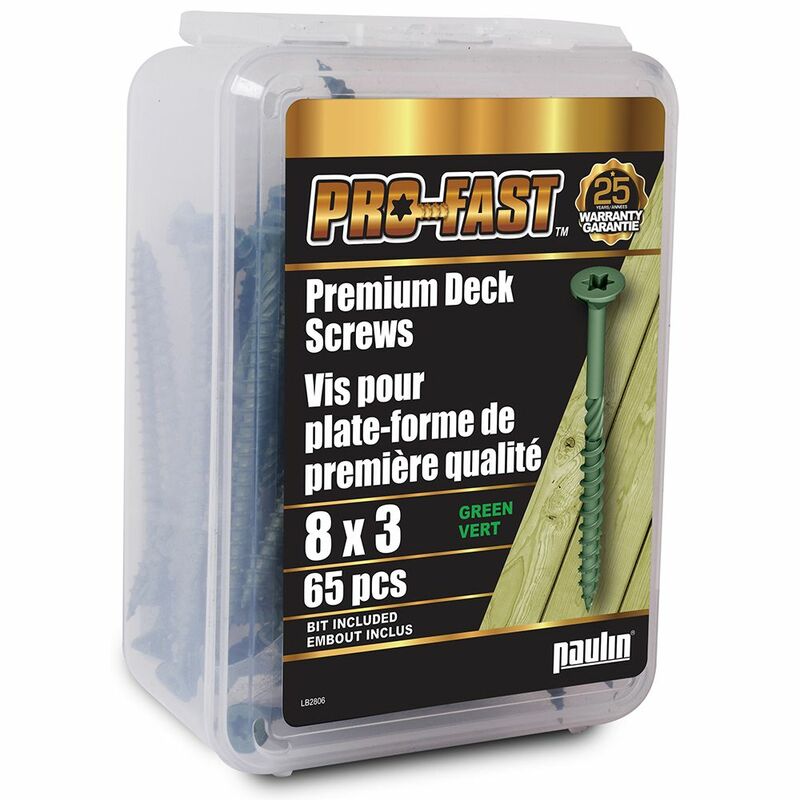 8X3 Pro Deck Green 65Pcs The ProFast Premium Deck Screw patented design requires no pre-drilling and is great for decking and all exterior wood projects. Specially formulated to prevent rust, staining or streaking in chemically treated wood including ACQ.